Chlorella is a single-celled, blue-green algae produced by photosynthesis - the natural process by which plants absorb energy from sunlight. Batches of algae multiply naturally and rapidly in pools of pure water. It is harvested at the required density. Chlorella cells have a tough outer wall, which limits the availability of nutrition. 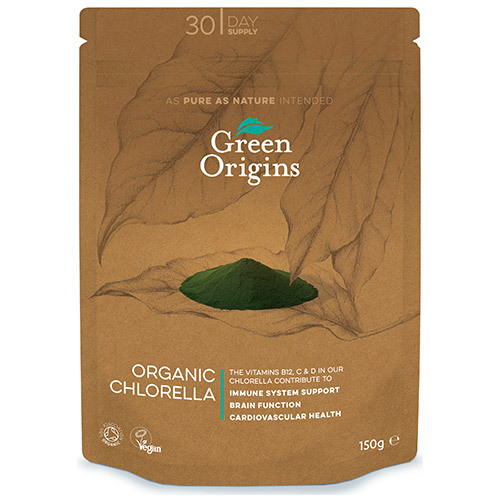 Green Origins Chlorella is known as ‘broken cell wall Chlorella’. Its cell walls are broken by a high-impact jet spray process before it is dried and milled to powder. Chlorella is high in Riboflavin (B2) and a source of Zinc, which help to maintain healthy vision and protect cells from oxidative stress. Organic Chlorella powder from Hainan Island. Take 1-2 teaspoons per day, mixed with water or a smoothie. Alternatively, sprinkle on or add to food. Start with a smaller serving and increase gradually. 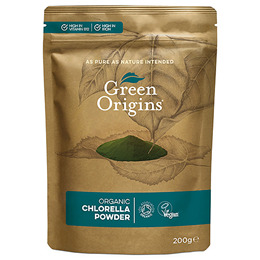 Below are reviews of Green Origins Organic Chlorella Powder - 150g by bodykind customers. If you have tried this product we'd love to hear what you think so please leave a review.